Th phrase is typically attached to the Dallas Cowboys. But with the way the Indianapolis Colts have been playing in recent weeks it is hard notto take notice of them. Except for the Jacksonville game, the offense has beenclicking for much of the season. The last few weeks their defense has been oneof the most exciting in the league. Oh—and then there’s the whipping they put on the Cowboys at home Sunday afternoon. Dallas fans probably figured they had more to worry about from Andrew Luck than anyone else. Their run defense was one of the best in the league (No. 3) and should be able to handle whatever the Colts threw at them. But that was not the case at all. Marlon Mack started the game gashing the Cowboys for a 19-yard gain and never really slowed down. He went on to have a career day carrying the ball 27 times for 139 yards and two touchdowns. Luck tacked onanother 20 and Nyheim Hines had 19 to give the Colts 178 yards rushing on theday. “We knew we had the ability to run the ball; we’ve done it against some of the top defenses in the league all year coming in,” Colts tight end Mo Alie-Cox said after the game. But as impressive as the run game was for the Colts, it wasn’t the star of the show—the defense was. While the Cowboys were able to move the ball in the first half, the Colts defense made all the right plays when they needed to most. There was the blocked field goal on the opening drive of the game. Then they shut Ezekiel Elliot down on a fourth and goal play on the net drive (and caused a fumble). When Dallas appeared to be lining up for a field goal attempt late in the second quarter, a sack on Dak Prescott took the Cowboys out of range. 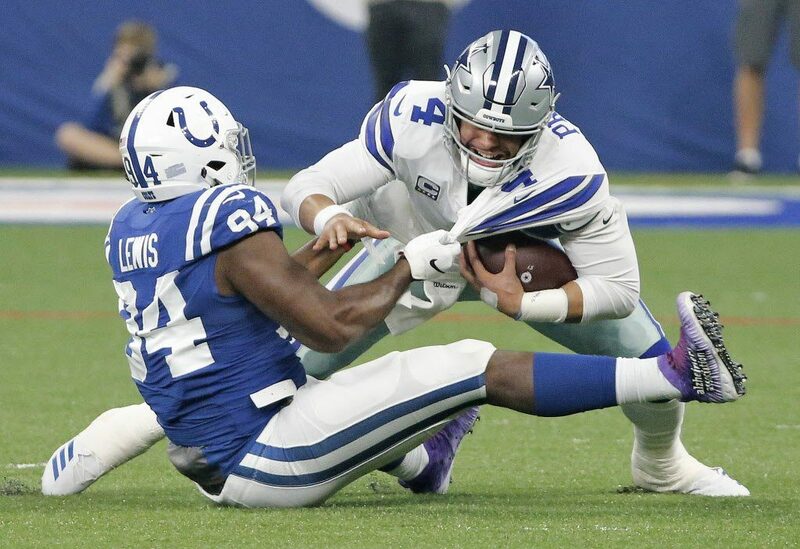 In the second half, between Marlon Mack’s running and the suffocating Colts defense, the Cowboys didn’t have a chance. When the game was finally over, the Colts beat the Cowboys 23-0. It was the first since 2003 that the Cowboys had been shutout. The loss brought an end to their five-game winning streak and will force them to wait until next week (when they face the Buccaneers) to lock up the division. With the win, the Colts improve to 8-6 on the year with seven of those wins coming in their last eight games. Right now, with how well they are playing on both sides of the ball, they are probably the one team no one wants to face in the postseason. However, to even make the playoffs this season they need some help. The Baltimore Ravens currently hold the No. 6 with an identical 8-6 record. But the Ravens have a tough game coming up against the Los Angeles Chargers. The Colts have two winnable games left starting with next week’s opponent, the New York Giants. They finish the season against the Tennessee Titans.